It's Just Mobolaji | Music & Entertainment: Jhené Aiko Performs ‘The Pressure’ on The Wendy Williams Show! 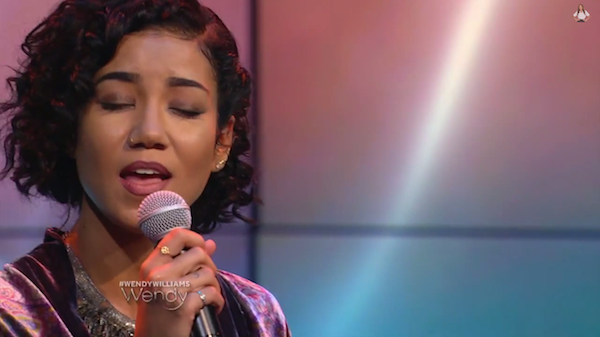 Jhené Aiko Performs ‘The Pressure’ on The Wendy Williams Show! Jhené Aiko took to the stage to perform an acoustic set of her hit single ‘The Pressure’, off her debut album ‘Souled Out’ for Wendy and her guests (bare footed of course), on the Wendy Williams show yesterday. The ‘Comfort Inn Ending’ singer has been nominated for a total of four awards at this year's Soul Train Awards in the following categories: Best New Artist, Video of The Year for ‘The Worst’, Best R&B/Soul Female Act and The Ashford and Simpson Songwriter's Award for ‘The Worst’. Jhené brings her calm presence to the Wendy stage as she performs a stripped down version of ‘The Pressure’.